1. The excellent packaging of all the individual modules and sensors. 2. The fact that all of the parts comes with the required accessory (wires, cables, battery box, etc..). 3. The parts' decent quality control, as it has been portrayed on them. 4. The wide variety of components in the kit itself (15 different components/sensors/modules). ​5. 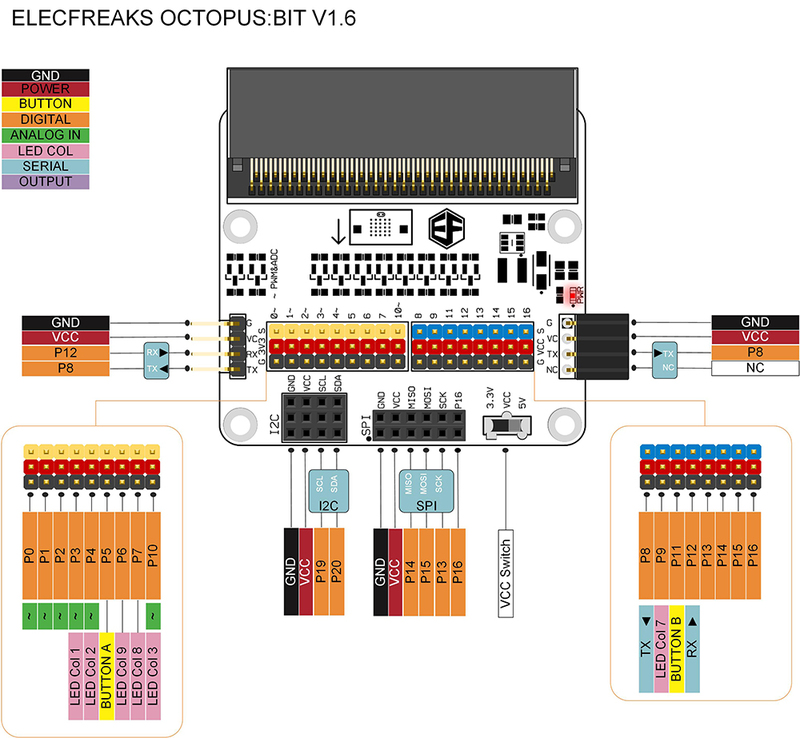 The components individually, as they're very innovative and unique, differing from other brands, and, Elecfreaks are distributors of Octopus products. 6. If this kit was being compared to another kit, this clearly stand tall over the other as it involves a massive variety of products included, especially since it's worth its price. GPIO (General Purpose Input/Output) pins: 19 usable GPIO pins for: i2c, light-sensing, digital input/output, PWM, serial transmit/receive, SPI, buttons, touch-sensing, and accessibility. 1. The many on-board sensors and modules it has, especially with its compact size. 2. The multiple softwares to write code and program the Micro:bit. 3. It's compatibility for all levels of makers in electronics. 4. The board being built with so many resources to learn and explore the Micro:bit (its libraries, forum, sample codes, support staff, etc.). The voltage and current depends on the type of batteries inserted into the holder and the load which the holder is being drawn to. 1. A battery cover with screws, securing it into place well. 2. A JST connector as its output, making an easier connection to certain components and modules. 3. An ON/OFF switch for additional protection and control. 4. It's small size and compactness for smaller projects with minimal weight. 5. The rigid battery holder structure which fits two AA batteries with ease. ​6. A lengthy and decent wire length, for longer connections and uses. The power may vary as it depends on the power coming from the Micro:bit attached. 1. The access to pins from the Micro:bit which is difficult to reach with alligator clips. 2. The additional power, interface and signal pins for a larger variety of other modules being attached. 3. The accessibility to the i2c and SPI interfaces for devices requiring those protocols. 4. The serial communication and programming pins to directly program the Micro:bit from an outside source. 5. A signal power switch for compatibility with devices requiring different signal voltages. The only error with this board is that the VCC pins (the red row of pins) states that it is +3.3 volts on the board, but it could be interchangeable to +5 volts via the power switch. Power will depend on the load of the USB cable. 1. The shorter length compared to other cables, it prevents tangles and this cable could be stored in limited space. 2. The multiple functions and purposes involved within a single cable which could be used for data, power and synchronisation. It could be also used in a wide range of applications in the electronics field as it isn't only an ordinary power cable for powering electronic devices. 3. The thick wiring involved in the interior of the cable for the transfer of power so that it could sustain its durability of the cable material while high current or voltages passes through it. 4. The stable connection to various USB female ports where both ends of the cable (Micro-B 2.0 and Type A 2.0) won't plug out easily. 1. Pre-soldered pins which makes setting up the OLED easier for a maker, compared to soldering the pin header on the OLED yourself. 2. The curved design at all the edges instead of pointed edges. 3. The smaller size and outline of the PCB compared to other OLED displays. 4. The pin markings at the back of the display, to minimize unnecessary wasted space, to cater for smaller projects. With those aspects, I think that this OLED display needs to add mounting holes for projects and full pin markings so makers won't be so confused on the connections, the pinout and translation of the markings are to the right. ​1. The long life time of the servo with a project. 2. The lighter overall weight than other motors to suit compact and smaller projects. 3. The durable material fitted in the interior of the motor and the case, protecting the motor well. ​4. The powerful torque, giving access to a heavier load for larger projects, especially. 5. The precision rotations on this motor; especially when programmed for specific angle degrees. 6. The operations on this servo motor, as they're very smooth, especially with lengthy cycles and long-term uses. Note: The SG-90 Servo Motor requires +4.8 ~ +6 volts power supply, it is recommended to use an external power supply while still using the Micro:bit for the signal pin to program the servo motor. For this, the Micro:bit breakout board is fine as it can give out +5 volts. 1. Its small breadth, so this sensor may be involved in portable or secretive projects regarding its uses, plus, it's minimal physical structure makes the sensor very compact to mount on any surface. ​2. The fairly simple hardware setup to the Micro:bit from this sensor, it's very direct to any user, as the connections comprise of three pins only with clear indications. ​4. Its advanced digital PIR Motion sensing driver chip, so it could have a better range and visibility towards its surroundings. 1. The very precise readings, being adaptive to slight changes in moisture. 2. The very fast response with high sensitivity to multiple various conditions of moisture in a quick time. 3. The small, overall structure of this sensor, with an exceptionally short height for placing it in project boxes or using it in small-scale spots. 4. 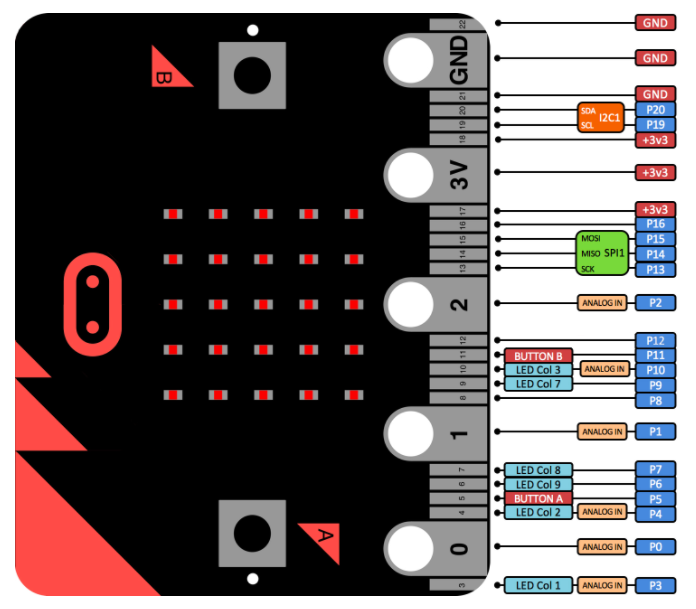 The simple hardware setup to a Micro:bit in which three connections will be made (VCC, GND and Signal). 5. The effortless software required, as receiving data from the sensor isn't that hard with minimal coding. 1. The two, different colour button caps included on the keypad already. 2. The simple software interface available with this keypad, as each button runs on a specific analog value when connecting it up to a microcontroller. 3. The minimum hardware connections inclusive with this keypad, as one signal line interconnects all of the buttons together for programming, as an input source. 4. The overall neatness of this product as all of its buttons are aligned properly and it uses slightly bigger buttons, rather than ordinary-sized buttons. 5. The placement of the five buttons, as it allows for button access when the keypad is held. 1. The sensitivity of the sensor/switch, which could react to any crash or touch. The sensor easily senses a change in the digital state (1 or 0), whether the sensor is activated or not. 2. The whole layout and hardware of the board, which makes the board so easy to place on a stucture, plus, the three wires (VCC, GND and Signal) of this sensor is easy to hook up in order for programs to run. 3. The software interface, as it runs on a digital pin, where the sensor runs on an ON/OFF state only, so it makes it easy to operate another device connected to this sensor, as an output source. 1. The compactness of this product for its usage when inputing this buzzer into a project box. 2. The volume of the sound it produces, which could be heard in a bigger area. 3. The clarity of the sound, in which when programmed for a specific frequency, the buzzer handles it well. 4. The extremely simple hardware connections and wiring this buzzer requires for microcontroller usage. 5. The fairly easy software needed in order to get this passive buzzer running efficiently. 1. Its digital software input (LOW & HIGH/ 1 & 0) to program the LED Brick easily with a microcontroller. 2. The module's control over brightness, which can be controlled via PWM (Pulse Width Modulation) for dimming or brightening up an area with the LED. 3. The simple physical connection from the LED Brick to a microcontroller as it consists of simple pinouts (VCC, GND and Signal). ​4. The substantial layout of the LED and the PCB, as it is closely-packed to convert the original analog LED interface to a digital interface. The board can be fitted into boxes or could be mounted onto surfaces directly. 1. A digital software interface (LOW & HIGH/ 1 & 0) to program this brick with ease. ​2. Access to PWM control, so this enables the brightness of the LED integrated into the brick to change. ​3. A simple physical attachment to connect the LED brick with something else, mainly because of the three-wire connection (VCC, GND and Signal). 4. The comprehensive PCB design and layout of this LED, keeping in mind that the original LED analog interface has been converted through this brick to feed into a microcontroller easily. 1. An enable digital software interface (LOW & HIGH / 1 & 0) to easily control this LED brick for turning it on or off. Furthermore, this brick allows PWM control (brightness control), so it enables you to either dim or brighten the LED. 2. A straightforward wiring setup from the LED to another device as an output, or as power. This brick consists of three main connections which simplifies the user's experience with using this product. 3. A fundamental PCB concept for this product, especially with its extensive features to convert an analog LED interface to a digital interface. ​1. A 300-degree rotation scale with a wide detecting scope, resulting in a high sensitivity and a high response time towards all analog values. 2. An additional part to any of your projects which require a manual change, such as a change in: the brightness of lights, an LED sequence, a slideshow etc..
3. Its simple software interface, as reading from this rotation brick requires a few lines of code, to find the analog value (0 to 1023) of the rotation, however, the max./min. turns only gives a value from 1 to 1020. 4. The potentiometer being turned into a brick, so that it requires three connections (VCC, GND and Signal).